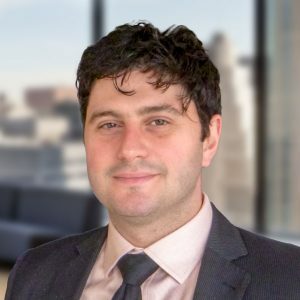 Alex Barmas joined DeSimone in 2018 and is currently a Senior Associate of the firm’s Façade Consulting Practice. Mr. Barmas has over 10 years of professional experience in the design, procurement, and construction oversight of building envelopes. He has worked in all aspects of façade consulting, including work with architectural geometry, building physics, building envelope structural analysis, facade system design and detailing, roofing and waterproofing principles, and project management. Mr. Barmas’ career has included time as a façade consultant and as a system designer for a curtain wall contractor. He has worked with and managed teams of facade consultants and technicians for a variety of project types around the world including innovative work with unitized fire-resistive façade systems. Mr. Barmas is currently working with the Stevens Institute of Technology on a development that includes two new student residence towers and a university center. The project entails complex window wall systems, high-span storefront systems, multiple green roofs, and a classic masonry facade designed to relate to the scale and the environment of the campus. Mr. Barmas has also collaborated on several mixed-use developments including Harborside 8/9 Towers in Jersey City, New Jersey, 25 Christopher Columbus Drive also located in Jersey City, 725 West Randolph Street in Chicago, Illinois, and a luxury hotel development at 456 Greenwich Street. Mr. Barmas earned his Master of Architecture degree from Princeton University in 2008 and his Bachelor of Engineering from The Cooper Union in 2005.